As the campaign season has finally reached a merciful end, a country attempts to figure out how it can get along with one another after a divisive, often obnoxious election process that left the country more divided than it has been since the Civil War. It is not just that the country seems to have found no common ground, but that the leaders who ran for the various offices seemed to have no real solution as to how to lead. One of the key words that has been used a lot during this campaign season is leadership. A lot of the candidates have questioned the leadership abilities of their opponent(s), often having no real idea what that word means. Fortunately, at Macalester College, they have a student who not only understands what leadership looks like, but one who carries himself in a manner that truly exemplifies what leadership is supposed to be. That man is senior Glen Hartford. Who coordinates with all members, resolving conflicts to see the success of the vision accomplished. When understood in this light, it is not difficult to see why Glen has become such a successful leader already. He has shown the qualities of leadership from the moment that he stepped foot on the campus, but that leadership came through a process of learning from those who have demonstrated the qualities that have turned this young man into one that is to be admired and who many will be willing to follow without question. It started with the inspiration that he gained from his mother. She has become the number one role model in his life and the one that he has most wanted to emulate. His father was also a great influence in Glen growing up, encouraging him to believe that he could accomplish whatever he put his mind to. That the only obstacle that would truly stand in the way of whatever he wanted to accomplish would be himself. One of the things that his parents encouraged him to do was to get involved in sports at an early age, and football quickly became his passion. He loved the sport and starred at North Andover High School (Massachusetts), but it was the coaching that he received that meant the most to him. It has been these teachings that he is not only applying to his own life but also incorporating into how he leads. As he entered his senior year in high school, Glen Hartford had many opportunities available to him. He had an impressive academic record in high school but his performance on the football field was garnering some attention as well. This afforded him many opportunities but there was one more key piece that he desired to ensure that his future was heading in the direction he envisioned. While the school met the three requirements he was looking for, what become the clincher for Glen was the coaching staff. They made him feel a part of something very special and they have helped to mentor him on and off the field. Glen Hartford would take an active role on the team from the first time he stepped on the campus. In his freshman season with the Fighting Scots, Glen appeared in nine-games, making 48-tackles. That total was fourth on the team and included his first sack and forced fumble of his career. 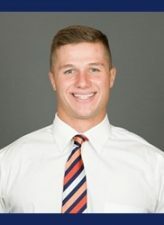 In his sophomore season, Glen would help the Scots to win their first Midwest Conference title and advanced to the Division-III playoffs for the first time in Macalester College history. He would appear in 11-games and record 52-tackles. In the conference title game against Illinois College, the outside linebacker made a single-game high seven-tackles. Just two years into his college career, Glen was a key contributor to the Scots success and was loving how he was being deployed by the coaching staff. 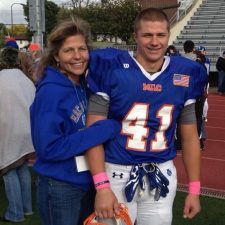 He had been an outside linebacker in high school, and loved that he stayed in that position at Macalester. It allowed him to use his many skills to be able to help the team. Last year, Glen played in nine-games, making 49-tackles and he set a career high in sacks with three. That sack total led the team and he set a single-game high with 12-tackles on Halloween against Carroll. 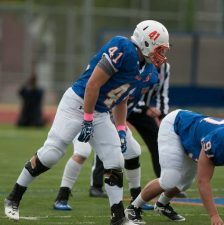 His success on the field and in the classroom earned him a spot on the Midwest Conference Academic All-Conference team. After winning the conference title in 2014, the Scots struggled last season, finishing 4-6. The team was looking to rebound this season and they have to this point, posting a 7-2 record heading into their contest against St. Norbert. Glen has been a key contributor on the defense, posting a single season high in tackles with 52 already, while adding 1.5-sacks. He also has an interception. This season, Head Coach Tony Jennison instituted a change to the Fighting Scots. For the first time since he became the head coach the Scots have permanent captains, and Coach Jennison knew that Glen Hartford was the one who he wanted to lead his defense. The senior understands that he is a trend setter of sorts. He gets that Forest Redlin, Tre Nowaczynski, and himself are defining how future captains will be measured, and he wants to ensure that the example he sets is one that is having an impact right now. What makes Glen such a good leader is that he is living out the things he preaches. 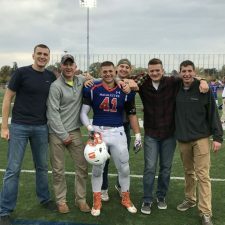 He came to Macalester, one of the most rigorous academic institutions in the country, looking to get a degree in geology, but wanting to pursue his military aspirations as well. Many scoffed at his ability to accomplish both and play football, but he credits his mother for giving him the drive to prove that he can accomplish whatever he sets his mind to. 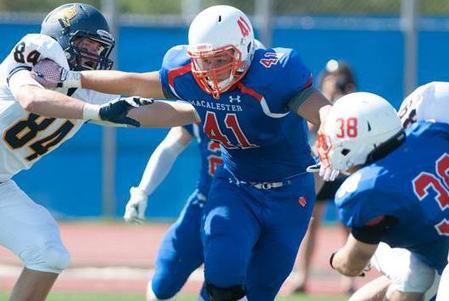 This Saturday will be the last game for Glen Hartford in a Macalester Scots football uniform. It will be a bittersweet moment for the senior, because he played a part in one of the most successful runs in school history, as the Scots have gone 24-16 to this point and appeared in the playoffs for the first time in school history. He also has helped to define what a captain will look like for future players and his leadership will be missed. However, the legacy he has left behind will make it so that there will be a part of Glen that will always live on at the school. He and the other two captains have set such a high bar that other captains will be working hard to be the same kind of leaders that these young men are. This is even seen in the way that the three have tackled social issues, most notably related to the issue of locker room talk (Watch the video here). Glen and his fellow captains have ensured that the model that they have set goes far beyond what goes on between the lines each Saturday. 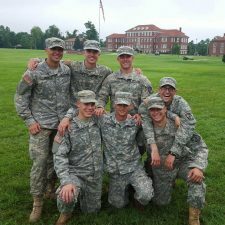 It is no surprise that these are the kinds of things that Glen Hartford is leaving behind as he prepares to leave the confines of Macalester College and joins the United States Army. In a world that is starving for leadership, Glen will be further honing his skills by leading the young men and women who are helping to keep our nation safe. He will be doing so with the same humility and wisdom that he has used to lead the Macalester College Fighting Scots football team. There is no doubt that a whole lot of Americans will sleep better at night knowing that the safety of the country has been entrusted to men like Glen Hartford.